Another conclusion derived from our evidence answers a much wider question of pyramid construction which has been much debated in the past. It concerns the problem of that stage in building operation when the outer casing was laid on and when it was dressed. Although, as we now know, the mantle of E3 had never reached its full intended height, the casing at the lower part had been both laid and smoothed from the very beginning. The same argument, of course, applies to the casing of the underlying step pyramids Et and E2. This is of particular interest in the case of E2, which, as now appears certain, was never completed. Turning now to the structural reasons for the collapse of the monument, something has to be said about the stability conditions governing a large building such as a pyramid. There is little chance that the mere weight of the monument, large as it is, will by itself cause its collapse. This is, of course, attested to by the success with which Zoser’s Step Pyramid and all the other great pyramids have withstood both constructional inadequacies as well as the ravages of millennia. In fact, they have proved to be remarkably stable structures, in spite of their immense size. The pressure exerted by its own weight at the base of a pyramid, such as that at Meidum, amounts to about 25 kg/cm2 (25 atmospheres). This is high for a building but not excessively so. It certainly would not cause crumbling of limestone in a well-built edifice. Taking the case of an ideally constructed pyramid, built with perfectly squared blocks, the pressure everywhere within the structure acts only downwards. At each horizontal face of any building block the force of the superincumbent weight acts vertically downward on the face of the underlying block. It is balanced by the rigidity of the building material and will not cause any deformation, except for the negligibly small elastic compression of limestone. However, once we depart from the ideal cube form of the blocks, these conditions change. If the surface of the blocks is somewhat irregular, they will touch at a few points only and consequently the pressure at these points of contact may rise to hundreds, or even thousands, of atmospheres, which is large enough to cause crumbling and serious deformation of the blocks. The result will be a movement of the building material in a direction to avoid this pressure - and that is sideways and out of the building. In other words, in a pyramid containing stones of irregular shape, the vertically downwards acting force will develop lateral components, favouring a break-up and flattening of the structure. It is therefore significant that the large hole in the north side of the Meidum pyramid core (Ex) discloses the imperfect nature of the masonry underlying the smooth casing. The blocks are relatively small and only roughly shaped, with large and irregular gaps between them. In a well-built pyramid, on the other hand, any lateral components developing from a weak spot in the structure will remain localised and a small deformation is likely to be taken up by the surrounding material. 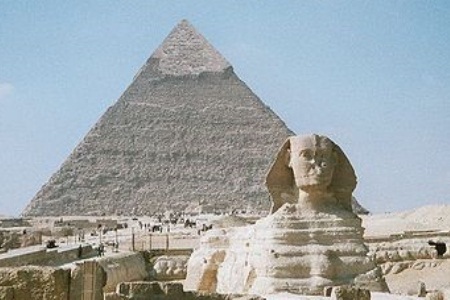 All that will happen in this case is a slight ‘settling’ of the building, for which evidence exists in nearly all the pyramids. It seems that Imhotep was fully aware of the danger of lateral forces and therefore introduced a stabilising internal In the first large stone building which he designed, Zoser’s mastaba, Imhotep used horizontal building courses and the feature which he introduced to ensure stabilitywas an inward inclination of the outer walls. This was simply achieved by cutting the outermost building blocks of each horizontal course at a slope. This type of construction, however, offers very little resistance to lateral forces. There is nothing to counteract an outward sliding of the courses except the friction of one building block lying upon another. This system, however, was completely changed in the subsequent design of the step pyramid built above and around the original mastaba. The core of the pyramid was given an internal structure of buttress walls at intervals of 5 cubits - about 2.5 m. - all leaning inward at an angle of about 75 °. The blocks forming these walls were of regular shape, giving them strength to prevent the masonry enclosed by them from moving outward. Such inclined buttress walls, but made of mud brick, had evidently been used with success in some of the tombs of the earlier dynasties. The construction of a whole mastaba in stone must have convinced Imhotep that, by using this new and hard building material, he could erect a far more impressive monument than anything which had been attempted before. His aim was to raise a structure of unprecedented height which should be as steep and commanding as possible. He decided on the buttress wall as the essential building element. From the crumbling of earlier mud brick buildings Imhotep must have been fully familiar with the undesirable development of lateral forces. Although at that stage the labour force at his command was clearly able to quarry, cut and transport limestone in huge quantities, he evidently could not count on obtaining one million tons of limestone in the form of perfectly squared cubic blocks. His pyramid would therefore not correspond to the ideal conditions outlined earlier and he knew that he would have to contend with the development of sizable lateral forces. He decided on counterbalancing these forces with inwardly inclined buttress walls of sufficient strength and in sufficient number. Although the sequence of building operations was, of course, quite different, the basic design of his monument can be described as a high tower rising to a height of 60 m. at an angle of about 75 °. Such a tower would naturally not be stable and so he had to support it with a series of surrounding buttress walls. Admittedly, the resulting structure would not be as steep and imposing as the tower, but by grading the height of the buttress walls outwards he still could achieve an imposing edifice. The result was Zoser’s Step Pyramid, and its stability and solidity are ample proof of Imhotep’s superb design. His successor at Meidum was not so fortunate in his efforts. Nevertheless, it is interesting that by a curious chance the ruin now provides us with the aspect of Imhotep’s basic design, the tall and impressive tower. However, Imhotep wisely decided to hide its grandeur by the strengthening outer buttress walls. These, of course, also existed at Meidum but fell away when disaster overtook the building. Our next task is now to discover why the Meidum building collapsed whereas Imhotep’s Step Pyramid at Saqqara still stands. Neither the size nor the original foundation of the Meidum step pyramids (E, and E2) can be held responsible. The projected building was not much higher than Zoser’s and as regards its foundation, the design at Meidum was sounder than at Saqqara. Instead of forming a structure superimposed on a mastaba with horizontal courses of masonry, the Meidum pyramid consists of buttress walls built directly upon a rock foundation. Nevertheless, the Meidum pyramid exhibits a number of design faults which nowadays, to us, are so obvious and dangerous that the catastrophe can be traced with remarkable certainty. Most, though not all, of these faults were introduced when the step pyramid E2 was changed into the true pyramid Es. One serious departure from Imhotep’s original design concerns the number and spacing of the supporting buttress walls. In Zoser’s monument the spacing of buttress walls is 5 cubits (about 2.5 m.), which means that there are two buttress walls for each step. 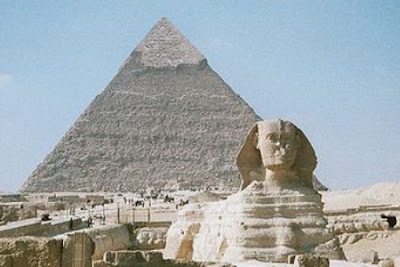 The same spacing was employed in the unfinished step pyramids of Sekhemket and Khaba. At Meidum the architect evidently economised by increasing the spacing between the buttresses to 10 cubits, which allowed for only one wall per step. He was possibly encouraged to effect this saving because he considered Imhotep’s design as unduly cautious. Nevertheless, the lateral forces against which the buttresses had to protect the pyramid were twice as large at Meidum as at Saqqara. In all fairness it should be remembered that Ej and E2 did not collapse spontaneously as long as they were left alone. The disaster was triggered off by the addition of K and it is conceivable that a major catastrophe might have been avoided by twice the number of buttress walls supporting the building. The real trouble was the decision to superimpose E3 on a completely unsuitable substructure. Both E, and E2 had their outer surfaces planed when the masonry of the mantle E3 was laid on. The smooth surfaces represented very dangerous slip planes and the ruin shows that the Es masonry was not anchored to these surfaces by anything better than a layer of mortar. Much the same can be said of the lack of adherence of E2 on E1. A conspicuous feature of the ruin is the unscarred surfaces of Et and E2 which indicate that the outer material was sheared off in bulk, simply falling away when the mishap took place. The process of transforming E into a true pyramid was carried oUt by first filling up the steps so that a pyramidical shape resulted, jlowever, these packing blocks did not rest as securely on the steps as was hitherto believed. When Robert ascended the building, he noticed that, although the underlying masonry courses of the buttress walls sloped inwards the two remaining top surfaces, those of steps 5 and 6 of E2 were laid sloping outward. This design is similar to Zoser’s pyramid and served the purpose of letting rain water run off the monument instead of seeping into its structure. This outward slope had not been levelled when packing blocks were laid on to the steps. The blocks were therefore less stable than they would have been on the horizontal steps drawn in Borchardt’s and Rowe’s reconstructions. The lower steps were destroyed in the disaster but there can be little doubt that they, too, had an outward slope and the accepted reconstruction has therefore to be modified. For some reason the builders were not satisfied with merely filling up the steps but extended the mantle outward by about 6 m. beyond the structure of E2. Since the top of the building has disappeared we do not know what motivated this design but it was probably necessitated in order to achieve the intended angle of 52°, i.e., an elevation of 4 in ^r. Whatever the cause, it constituted the most serious threat to the stability of a building which already suffered from a number of design faults. The filling blocks resting on the sloping steps received only a limited amount of support from the buttress walls and this was not even the case for the mantle as a whole. The packing blocks and those used in the outward extension of the mantle were not well squared and the force exerted by their weight acted not merely downward but to a large extent along the surface of the mantle itself. In other words, the force acting on any point in the mantle was very much larger than the weight of the blocks immediately above it. This force rose steadily as the accumulated weight of the mantle increased until it caused its structure to bulge out of the pyramid. As a result, the whole mantle slipped and crumbled, taking the third and fourth steps of Ej and E2 with it. How and where the catastrophe was triggered off cannot at this stage be determined with certainty. It may have started on one of the slip planes but it seems equally or even more likely that the R.p.—6 IOI initial failure occurred in the mantle itself. Owing to the seriov»1 structural faults of the building there was no chance of any local failure to right itself by ‘settling’. Wherever the first breach in the structure took place, it was bound to become immediately cumulative, resulting in a sudden and large-scale disaster. Examination of the casing of E3 near the mortuary temple shows the lowest courses of casing stones to be smooth and in perfect condition. Higher up, the casing becomes progressively more scarred, and this is quite consistent with a landslide of rubble careering down over the pyramid casing in which more material will pass across the higher than across the lower courses. When Petrie examined the casing in 1910 he tried to explain its damaged state as due to ‘weathering’, but nevertheless described it as ‘chipped’.